Stitching completed? Looking for ideas for needlework finishing techniques? 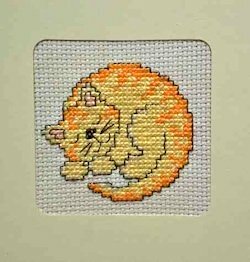 You may have had something in mind before you started stitching, but if not, perhaps this page will give you some ideas. It is such a shame to stuff your needlework project into a drawer and leave it there, where no one can see, admire or enjoy it. There are so many choices you can make when it comes to finishing your needlework. Is it going to be framed and hung on a wall? Made into something useful? Given as a gift? 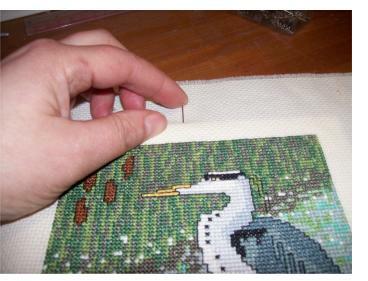 Whichever choice you make the first step is often cleaning your stitched piece. Dirt and grease from your hands can transfer onto the fabric during the stitching process, hoops can leave marks or the piece might just need freshening up. Let me share my methods for washing needlework and you can join me in my "happy dance". Don't panic if your work is stained, check my stain removal tips for something that might help rescue it. Once your work is washed the next step may be to frame it. Learn how to stretch your work the easy way ready for framing. Handy with a sewing machine? Or like hand sewing? 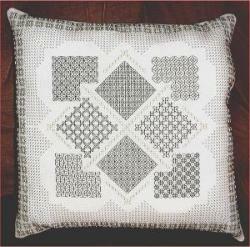 Making something useful is a great way of finishing your needlework. After all we only have so much wall space for pictures, don't we? As needleworkers we all need pincushions, needlecases and scissor fobs. Cushions or pillows can add a touch of colour to your living areas, or luxury to your bedroom. Doileys, mats and runners also add that special touch to your table or bedside cabinet. A neat hemstitched edge can be the perfect finishing touch. Finish your cross stitch designs as ornaments for the Christmas tree. Mark your page with a special bookmark in either blackwork (with a fringe) or hardanger with a buttonhole stitched edge. Mount your work in an aperture card to give to a loved one on their birthday, or try Rachel's way of making a different sort of card. I am sure you will come up with many more ideas.